I thought that telling our story would bring me some peace. I laid that burden, too, on time—thought that the passing years and the life experiences and the wisdom gained would make me feel better about our relationship. About you and I. About what we were not. But it hasn’t. Speaking our story out loud only brings more confusion and bitterness and anger. Mostly, it makes me incredibly sad. I’m used to this lethal jumble of emotions, you know. For so very long, they’ve kept me numb—made my heart perform its function sans one of its most crucial human elements: feeling. Perhaps it’s in my DNA. The part I get from you. Or maybe it was learned—a defense mechanism slowly created across the span of missed birthdays, and Thanksgivings and Christmases, missed school and music recitals, missed moments of encouragement and discipline, a childhood devoid of hugs and kisses and reassurances that everything would be all right because Daddy would see to it that it was so. Absence does not make the heart grow fonder. It anesthetizes it. This, I know for sure. Still, I love you. Because you are my father and I am your daughter and that is as it should be. And when I tamp down the unsettling emotions and push the darkness far into the recesses, there is some sliver of light that reminds me of all the things I loved about you—those big ol’ eyes, that hearty laugh, that wide, toothy grin, those long fingers and sturdy arms that I lived to fold into. The way that grumbly, froggy voice of yours sang out my name. Sharon. Recently, while I was helping my mother move, I found one of the many reel-to-reel tapes you made for her, and, to my surprise, it contained a personal message to Mom and me! You were in Germany making the film Kisses In the Night and recording the duet, “Uncle Satchmo’s Lullaby,” with an 11-year-old German girl named Gabrielli, and you said that she reminded you of me. Me! All the way in Germany, busy as you were, you were thinking about your daughter. Even as you scolded, warning me that you’d keep my presents if I weren’t a good girl and saying you were a tough daddy because you came up the hard way, I loved that you were talking right to me. And when you laughed that big, robust laugh and said I’d be getting my presents anyway, I laughed too. And then tears filled my eyes. I was both ecstatic and deeply saddened by that recording. It made me happy because it confirmed what I always knew: you were proud to be my dad—as much as I was, and am, proud to be your daughter. But that joy is diminished by your not being there. See, the showing of the love—that’s what’s most necessary in a relationship between a parent and a child. Those tender moments, when there is no stage, when the spotlight isn’t shining, when nobody else is watching and documenting the hugs and the kisses and the simple things, like playing a board game together or snuggling on the couch, enjoying a TV show with one another, or sitting down for a family dinner—that’s what draws a child closer to you. You always took great care to remind me of the financial sacrifice you were making for me, and how you were working hard and far away for my own good. Because it was important for you to supply my needs. You did, and for that, I’m grateful. What I needed most, though, you refused. I needed you. Not socks full of coins. Not savings bonds. Not fancy presents purchased in random stores in Germany. Not recordings of you singing with other little girls and clipped warnings to be good, or else. Until now, I’ve been nothing more than an enigma—a footnote in your narrative, worthy, in some cases of not even a sentence. “He thinks he had a child…”—that’s what was written in the foreward of one book that chronicled in great detail your many writings. Funny: that book showcased a letter in which you explain in great detail how I was conceived, but in all the years since you’ve passed, in all the books that have been written by and about you, even in the midst of the making of an upcoming biopic directed by and starring Forest Whitaker, which promises to reveal new details about your life, no one’s ever bothered to see if I really exist. Those who did know—and there were many— made quick work after your death of making sure I stayed invisible. To erase my very existence. I often think back to the humiliating way Mom and I were treated when you died—being told not to attend your funeral. That I was denied the chance to pay my respects and give a proper goodbye to my own father was confusing as hell back then. Today, I think it a travesty—a disgusting display by a bunch of adults too heartless, greedy and mean to care that a 15-year-old child should be able to mourn her father. The pain of this sears. Being rendered invisible hurts. I need you to know that. The impact manifested itself in so many destructive ways—promiscuity, abuse, teen pregnancy, poverty, depression, anger. My relationship with my mother has always been fractured. Tricky. We love each other deeply, sure. And, bad decisions, flaws and all, our bond is unshakeable. She is the only parent I had. But the edges are frayed when it comes to you. She’s so sad that I’ve written this book—wishes I could understand and honor her point of view on the matter. If it were up to her, I would have taken this secret to my grave. 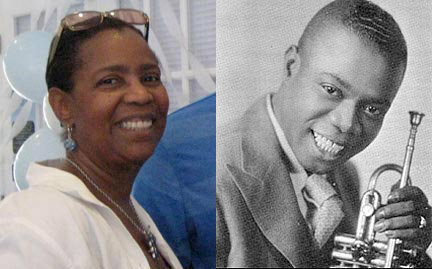 This passage is an excerpt from Little Satchmo: Living In the Shadows Of My Father, Louis Daniel Armstrong, written by Sharon Preston-Folta, daughter of the legendary jazz trumpeter Louis Armstrong, with MyBrownBaby’s own Denene Millner. Little Satchmo is available for $2.99, exclusively on Kindle and iPad HERE. 3. A Second Chance: Should Kelly Rowland Let Her Absentee Dad Back In Her Life? Remember, a few years ago, a woman was sent to jail for claiming she was Bill Cosby’s daughter? Cosby admitted paying the young woman’s mother $100,000 to shut her up about their affair but insisted he was not her baby’s father. We, men, can be so destructive. We make lives then sentence them to despair and misery. ▶ Kim Kardashian and Her Expanding Pregnant Belly: Um, She’s SUPPOSED To Get Bigger. Geez.